On the first night of our trip to Chiapas, we found ourselves in the central plaza of Tuxtla Gutiérrez, Septemeber 15, 2007. I didn't see any other tourists that night; I stuck out like a sore thumb. I ate an overpriced carne adobada steak with a plastic fork and butterknife, on a plastic plate, over a plastic tableclothed plastic table. Needless to say, it wasn't easy to eat and I spilled most of my drink from the wobbly cutting. This was the first real "grito" I've witnessed, besides the televised version of the president in Mexico City. Here, the governer of Chiapas does the honors. Rosario says it was the weakest grito she'd ever seen. 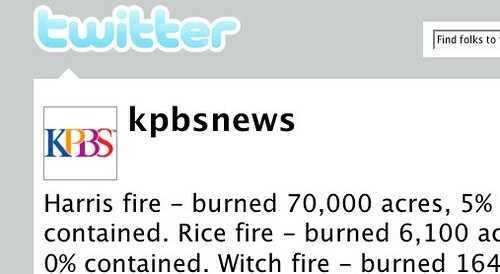 I’ve been working from about 5 p.m. to 3 a.m. the last few nights to keep KPBS.org updated. Our web team, along with the news staff and other volunteers, are taking turns to keep everything up and running 24/7. As I was finishing up early this morning, Doug Myrland (KPBS general manager who was working overnight on-air), asked me a few questions about the Google map to give people a sense of how we’re doing it. Much has progressed since this recording. Google has joined the effort to streamline updates, and those who have been updating the county maps will now be contributing directly to our Google map. 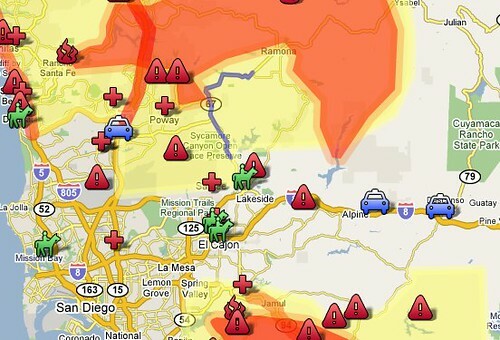 In addition, a site from Governor Schwarzenegger, calfires.com, has embedded the map directly. Local CBS is linking to the map. Wired bloggers Michael Calore and Kevin Poulsen reported on KPBS’ use of Twitter and Google maps. KPBS’ broadcast tower at Mount San Miguel (along with several other towers) has burned in the fire. They’re now broadcasting from FM 94.9, streaming online from both kpbs.org and fm949sd.com, as well as through cable television. Taken on the evening of 10/21/07. We were forced to evacuate the next morning. Escondido, CA. — Smokey Sunset, originally uploaded by prgibbs. About 3:30AM looking southeast from Old San Pasqual. This is a very short distance from our house. Escondido, CA. — Fire!, originally uploaded by prgibbs. An easterly view of our home just prior to our evactuation at approximately 6:30AM on 10/22/07. Escondido, CA. — Evacuation #1, originally uploaded by prgibbs. About 7:30AM on 10/22/07 looking south on Orange Ave., Escondido, CA. — Orange Ave., originally uploaded by prgibbs. About 8:30AM on 10/22/07. Looking southeast from my parent’s yard. This is a full color photo, not sepia. Escondido, CA. — Smokey Sky, originally uploaded by prgibbs. Shortly after 9:00AM, we received another evacation notice. Me posing before we hit the road…again. Escondido, CA. — Evactuation #2, originally uploaded by prgibbs. nathangibbs.com on iPhone, originally uploaded by Nathan Gibbs. Photo taken, uploaded and posted here all from inside an Apple store using demo equipment (Safari on iPhone, Photo Booth on MacBook).